And so it goes. 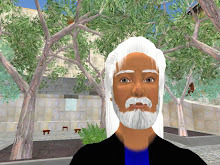 Between a bit of touring in-world, and a lot of reading of Second Life blogs, I'm getting familiar with the place, with its populace and its particular culture. I imagined that one day I might proudly remind my children that I was an early pioneer of virtual worlds. But when I tested this idea out with them, their reaction was disappointing. They think I'm just a misguided fart making a fool of himself playing at a children's game. Jusst a tip, but try www.wordpress.com - they offer a free and VERY easy blogging solution. I've used WP on my own host and on their own free .com site and I have to say that the free site was better as all the drudgery of updating, etc. is done for me. They also offer an easy to use import-from-blogger solution which ported my old blogger account to the new wordpress one in minutes. I had to do some tidying up, but it was all there - posts, photos, links and comments. Thanks for the tip, HeadBurro. Danton will probably stay with Blogger, but I'm looking for solutions for a RL blog. I recently installed Wordpress on my web server, and realised that it will be a lot of work to get beyond the boring default blue banner. So I might try www.wordpress.com as an easier way to get familiar with the software. You'll not regret it - easy, friendly and flexible - everything I found blogger to lack in. Hi Danton! Everybody has a "favourite blogging software" — and this is mostly a matter of personal choice and what you wish to accomplish with the tool. I also previously used a (now obsolete) content management system for my own blog. I had to abandon it because it simply was too cumbersome to maintain — it was developed before RSS feeds or Sitemaps existed, not even to mention things like tags or trackbacks. So it was time for a change. I've quickly narrowed it down to a small number of possibilities: LiveJournal, Blogger, Typepad, and WordPress. Of those, I thought that Blogger was the easiest to use, but it was also somewhat limited. But at the end, it was clear that none of those allowed me to do what I wished: tweak the blog, add things like my online status in SL, add all sorts of links and tags to other ranking tools, or get some income out of Google AdSense! For that, I needed to run the software on my own server. At the next stage, if you install the software on your own server, you can add anything to it. I estimate that there are perhaps 30,000 or so different templates to chose from, and probably as many plugins (or certainly it looks like that). WordPress blogs hosted on their own servers are notably famous for having so many things displayed there — and sometimes, thanks to the zillion plugins, they don't look like WordPress at all! The flexibility is tremendous due to the openness of its platform and the easy of changing it all. A good friend of mine switched over from Blogger to WordPress in just three days (during the week — so she did not have much time free). This meant importing all content (nothing was lost), keeping all the links, changing to a template that looked almost exactly to what she had on Blogger, and make sure everything worked flawlessly. She's no programmer, but she's pretty clever — with one tip or two from seasoned Wordpress bloggers, and googling for more information, she managed to do it all on her own. I find that a quite good recommendation for people looking for another software solution.